Equally happy used in sweet or savoury recipes, rich with buttery flavour that works wonderfully teamed with just about any filling you can imagine. Maintaining our reputation as the UK market leader means we never rest on our laurels. Our artisan roots are still very much at the heart of who we are and we’ve invested £600,000 in our equipment since 2011, so our production facilities feature bespoke machines. They’re run by an experienced team who use only top quality ingredients – and everything we do revolves around bringing you the very best products and the very best service. Ron purchased his first crêpe machine from Brittany – home of the crêpe – in 1982, investing in the best quality machinery available to him. It was a sign of things to come; a clear case of starting as you mean to go on. All these years later and Crêpe Cuisine remains dedicated to excellence. Focused on every aspect of production, we know how attention to detail is reflected in the end product. This detail can be seen in our product innovation, inspired by our team’s regular visits to food exhibitions and informed by our travels to Europe, the US and Asia. It’s where our new products and flavours are born. You can also see it in the way we offer all our customers a full service, from product development to packaging. We’ve recently invested in a second Thermoformer machine, which means we can produce fully recycleable plastic trays. Plus, we can print artwork labels to your specification. The end result? 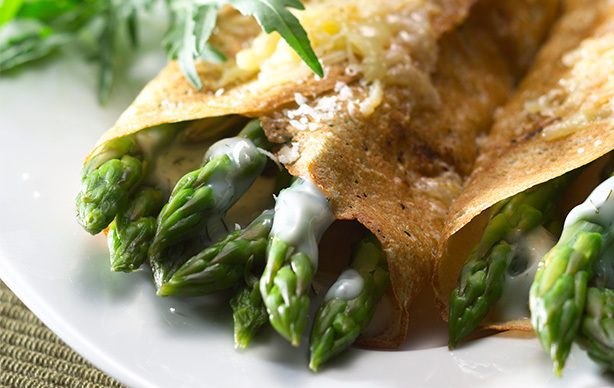 Crêpe Cuisine can deliver a product that’s ready to go straight on the shelf. Our recent investments have doubled our capacity, showing our commitment to excellence and efficiency… and how we’re happy to put our money where our mouth is! Building on our success by continuing to grow, we’re focused on remaining flexible, always meeting your needs – no matter the lead time or volume (we’re proud to say that in 30 years, we’ve never missed a launch).